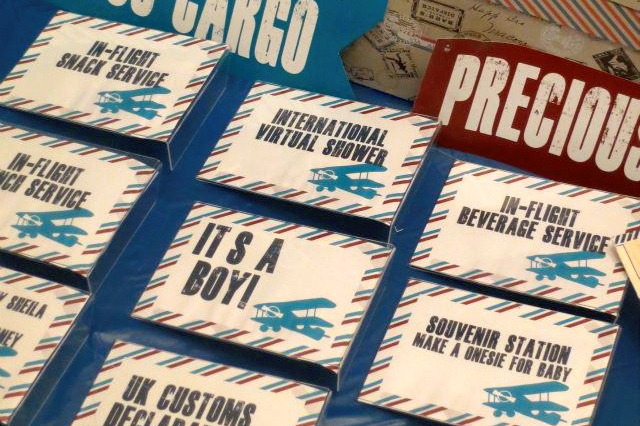 Yes, I said Virtual Baby Shower! 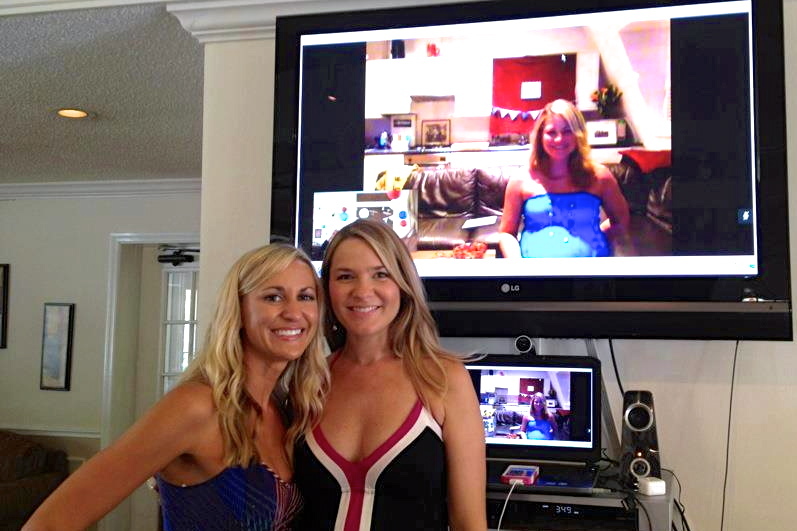 I was so honored to plan this Virtual Baby Shower for one of my besties. At the time the mother-to be, Sheila was living in London, UK. 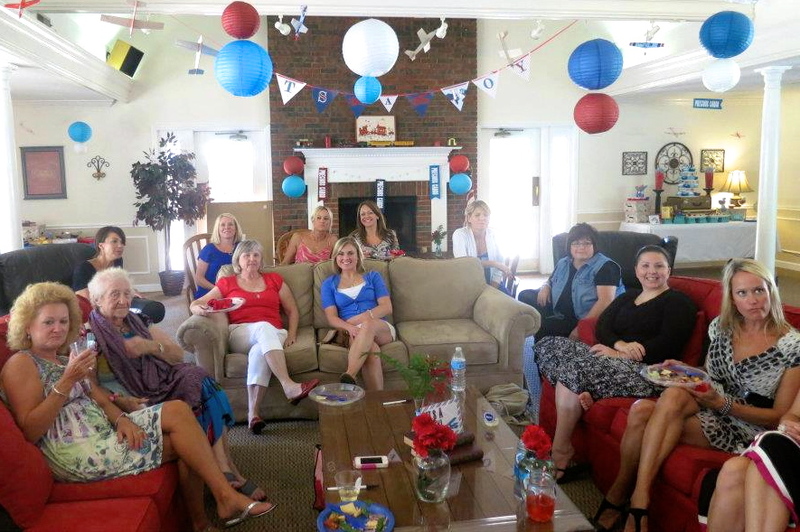 All of her friends and family were back in the states. 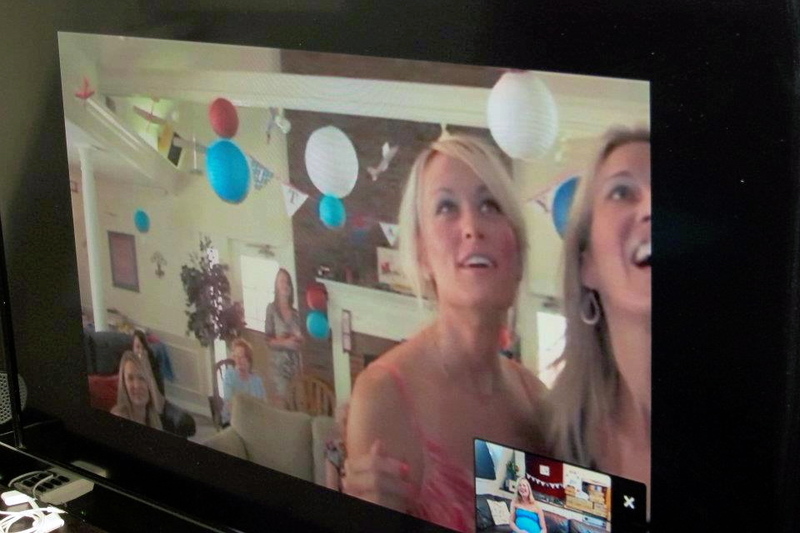 A trip home for her baby shower was not in the cards at the time, therefore we decided we would bring the baby shower to her, VIRTUALLY. I partnered with a friend that works at Cisco, to make our baby shower experience come to life. 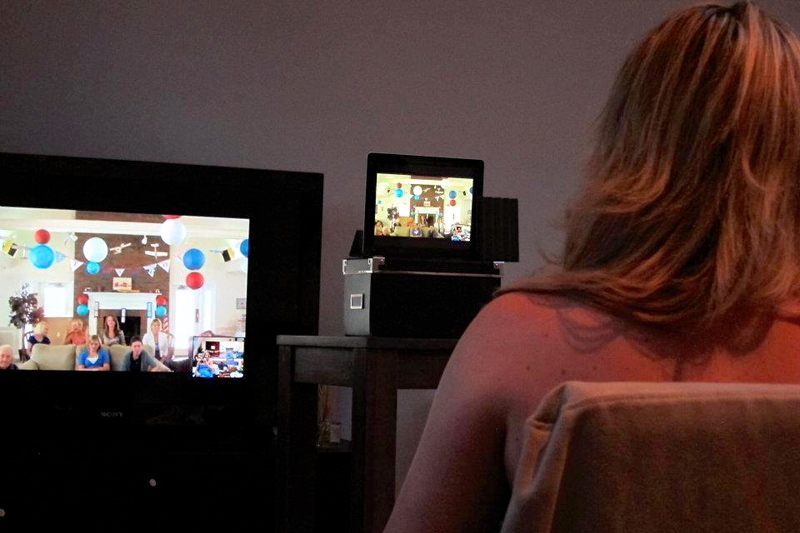 After several trial runs in the baby shower rental space, software downloads, iPad test runs, TV test runs, Skype, wireless motems tests, WE WERE A GO! Now with the main part of the shower’s LIVE experience behind us, it was time to plan the theme of our event. 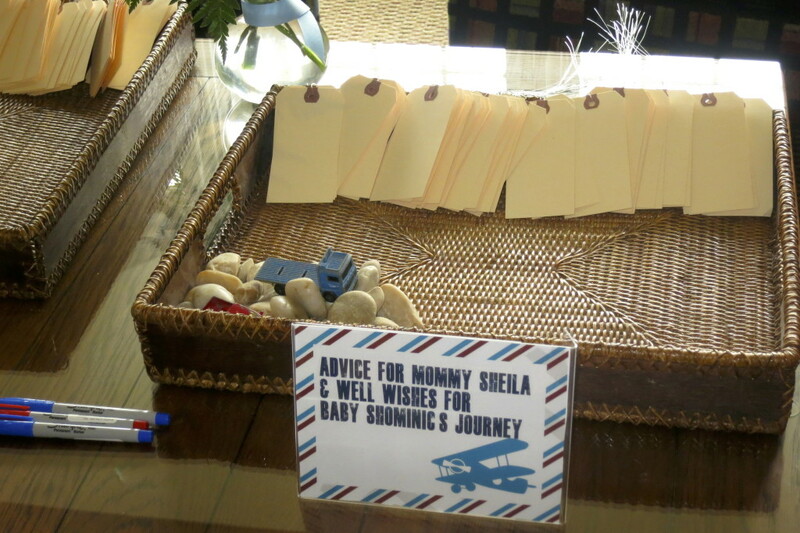 Anyone that knows the parents-to-be, Sheila and Dominic knows that they are world travelers. Its been a part of who they are since they met, a part of their careers, and passion. 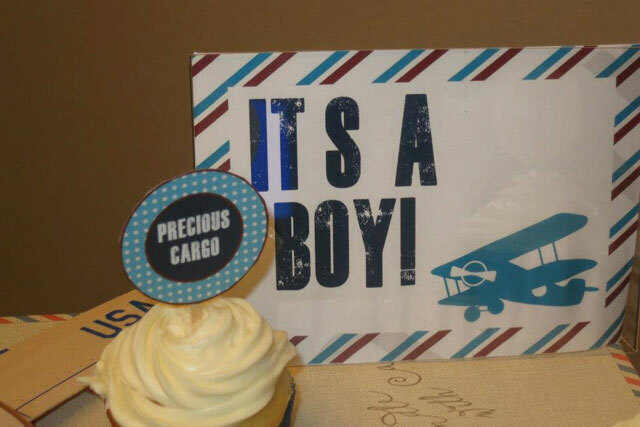 Therefore it was only fitting we host an event that showcases their personalities with a “Precious Cargo” Vintage Travel Theme Baby Shower. We partnered with Paper Frosting to put our ideas on paper. Many of the vintage props such as old suitcases and books used throughout the shower were from Sheila’s mother’s own closet. 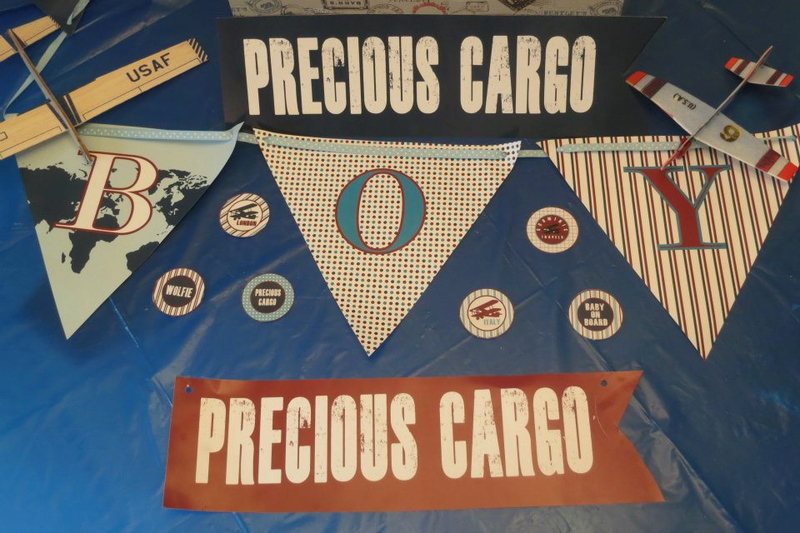 We mixed her “found” decor with pieces from our own personal collection and created an amazing blend of design elements for this “precious” event! After visualizing a real International travel experience, we decided it would be fun to have the guests feel “in-flight” to create an ambiance reminiscent of a “world traveler”. 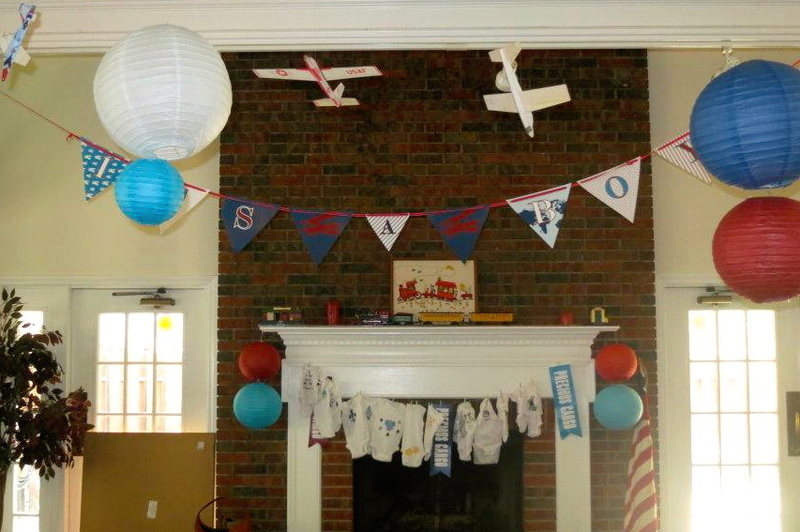 We hung vintage airplanes throughout the space along with red, white, and blue paper lanterns. Multiple stations were setup with a different “in-flight” feel. 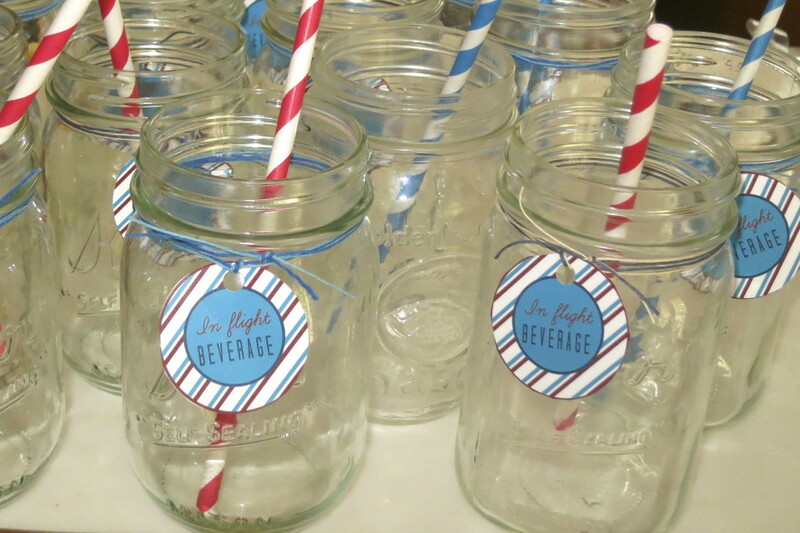 The “In-flight” Beverage Station included drinks labeled and served in “in-flight” mason jars. The drink of choice that day matched the color scheme of course. The red fruit punch included floating blueberries and a second option of blueberry punch included floating strawberries. 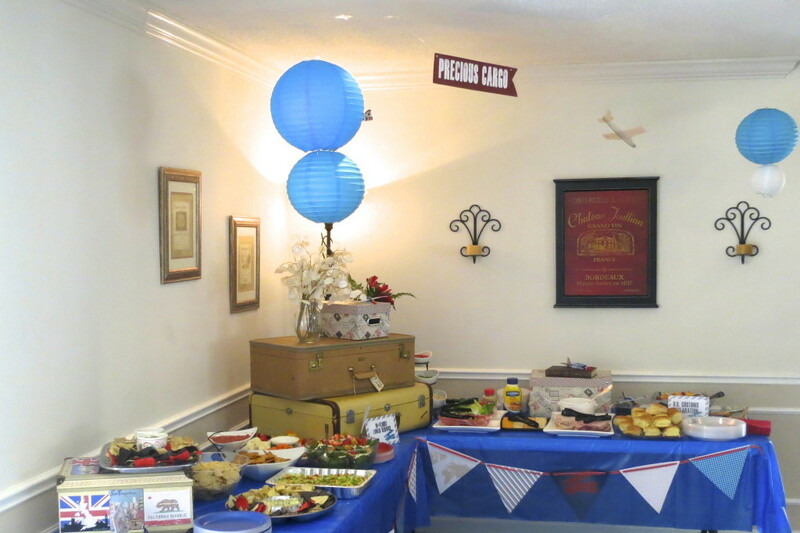 The “In-flight” Lunch Station included a variety of food for the guests to enjoy, along with darling vintage decor on the table. 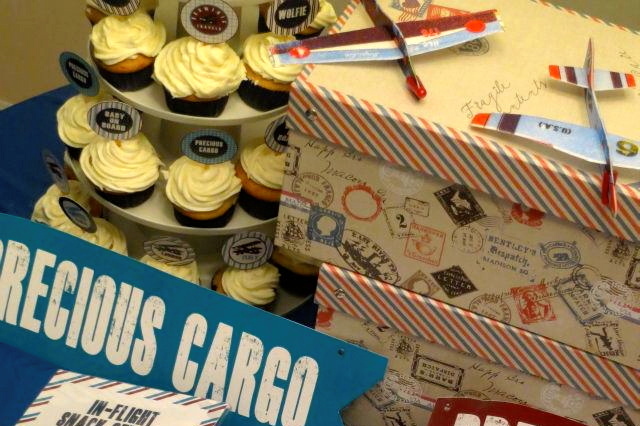 The “In-flight” Dessert station truly showed off some of our favorites. 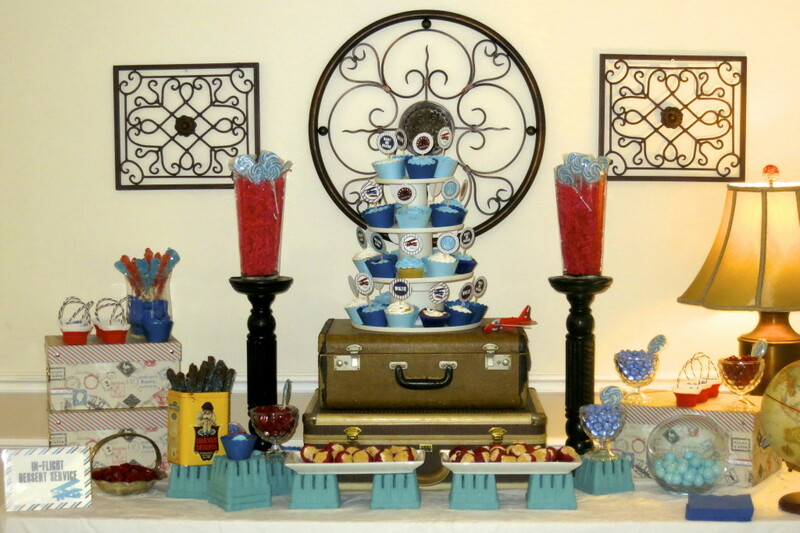 For our display, we placed berry baskets throughout that held some of Sheila’s favorites such as strawberry stuffed cheesecake, chocolate covered pretzels, and of course a variety of sweet treats in red, white, and blue. Let’s not forget the adorable cupcake tower. We really wanted to personalize this for the parents-to-be. 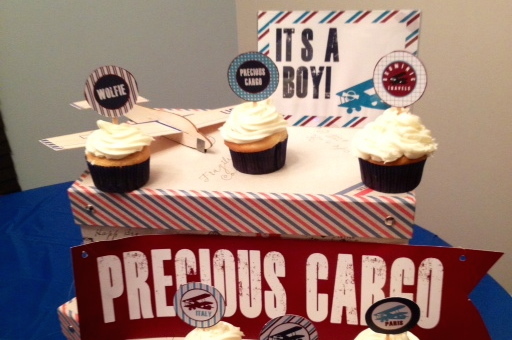 We had cupcake toppers created that had names of places that symbolized them and their future son. 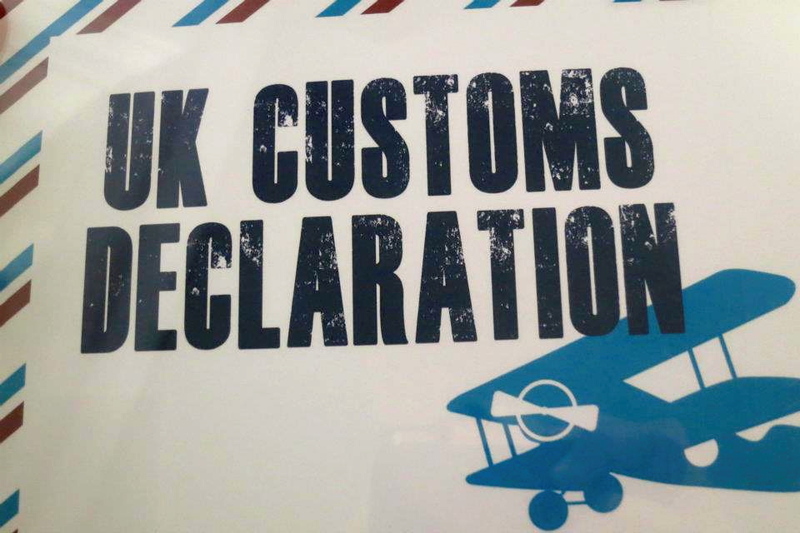 The toppers included names such as London, Italy, Wolfie, Shominic Travels, and Baby on Board. 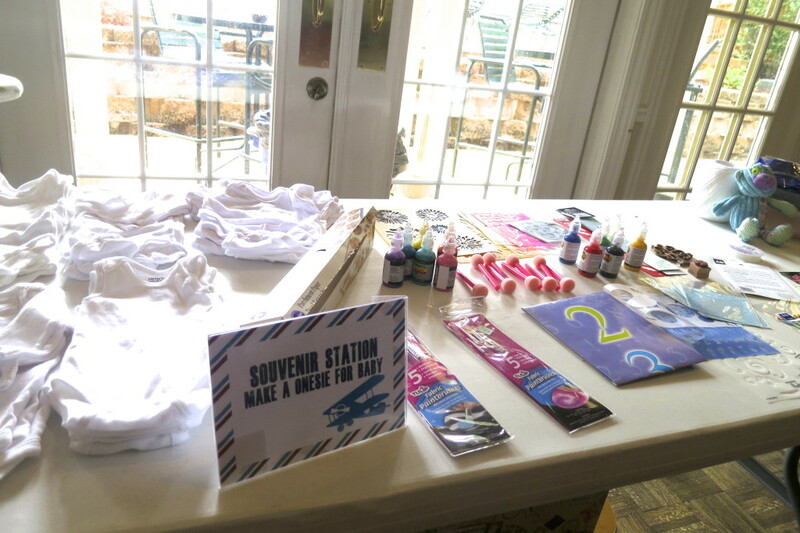 The “In-flight” Souvenir Station was a must. 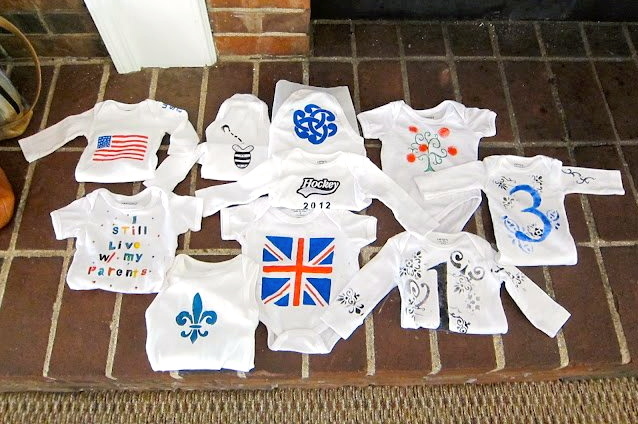 With Sheila being in London we thought how cute to have onsies made for the little guy and ship them over to her. So an activity we had was creating onsies that showed off all her girlfriends personal style. Amongst all these details, was a truly memorable event. We all got to spend a lot time with Sheila VIRTUALLY and that is what it was all about! Her husband prepped her Virtual space with décor that matched our theme back in St. Louis so she really felt apart of it all. We watched her open all her shower gifts that were sent to her in London, LIVE. Being able to share in the wonderful conversations between her and her family made it even more special. As friends, we all got to have many personal conversations with her and a lot of laughs just like old times. This event was definitely one for the books! It just goes to show it doesn’t matter where you are in the world, thanks to technology we can still celebrate such happy moments in life together!